SPJ - Gold and Carat The Carat and Gold Series is designed with mechanical attributes that guard against shock and overload to protect the weighing cell. The SPJ Series is simple to use with 2 clearly marked buttons and a large LCD with clear numeric and unit indicators. 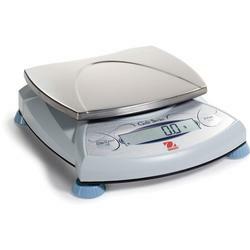 Quickly zero the balance or toggle through available weighing units with a quick press of a button. A calibration lock switch prevents calibration access. Includes large stainless steel pan. The Ohaus SPJ Series Scales are affordable, multifunction scales capable of weighing in grams, carat, pennyweights, ounces, troy and ounces and many other units. These scales also have parts-counting capabilities. Clear, bright LCDs make them easy to read. They are supplied with 110 Volt AC adapters and also run on 9 Volt batteries with programmable auto shutoff to save battery life. They measure 7.5?W x 8.3?D x 2.1?H.. The SPJ Series is covered by a two-year manufacturer?s warranty. Parts Counting ? The SPJ is designed for counting parts for inventory control, parts bagging, receiving, dispensing and ticket counting. Select from a sample size of 5, 10, 20 or 50 pieces while in counting mode with a quick button press. The SPJ features user-enabled automatic recalculation of the average piece weight ? instead of counting 100 parts for a sample, count 10 and let the SPJ count the rest of the sample! For applications where automatic recalculation is not desired, the easy-to-use menu system allows this feature to be disabled. The SPJ can also be configured for situations where only the counting feature is required. Percent Weighing ? 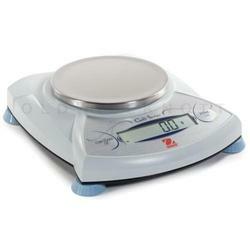 Use the Percent Weighing mode to compare samples for compounding, formulation, or quick weight checking. Place your reference weight on the platform, enter the weight into memory, and the display will show the percentage of the sample weight on the platform compared to the reference weight. Totalization ? Use the SPJ?s memory function to repeatedly sum the weight on the platform for compounding and formulation. Unlike other balances, the SPJ allows totalization up to the limit of the display! Display Hold ? The Display Hold mode allows you to retain the weight of an over-sized package on the SPJ?s display. Great for postal and shipping applications! User-Configurable ? The SPJ allows you to select active weighing units and modes using the two-button keypad. SPJ can be quickly configured using an on-display menu system ? there are no cryptic codes to input! A built-in lockswitch prevents reconfiguration during use. The carat and gold series is designed with mechanical attributes that guard against shock and overload to protect the weighing cell. The SPJ series is simple to use with 2 clearly marked buttons and a large LCD with clear numeric and unit indicators. Quickly zero the balance calibration access. Includes large stainless steel pan.